White House photographic print taken in 1961 by White House photographer Cecil Stoughton. Boldly signed by Jacqueline Kennedy at the lower left. Stoughton took multiple photos in front of the White House fountains on the South Lawn when developing the 1961 Christmas Print. The final Christmas print, which showed more ducks positioned closer to the photographer, is derived from a different photograph taken moments before or after this mock-up. Here, the ducks are positioned on the far side of the pool and the camera was positioned at a slightly different angle than that used for the final Christmas Print. Matted and framed with a full length printed portrait of Jacqueline Kennedy after a painting. The entire piece measures 20.5 inches by 31 inches. Rare and desirable. Jacqueline Kennedy hand writes the first lines from the Robert Frost poem Stopping by Woods on a Snowy Evening. From the collection of Mary Gallagher, who was the personal secretary to Jacqueline Kennedy from 1957 to 1964, which includes the Kennedy presidency. Before that, she was Senator John F. Kennedy’s secretary and worked briefly for Jackie’s mother. Robert Frost was one of President and Mrs. Kennedy’s favorite poets. He was invited to present two of his poems at the Kennedy Inauguration on January 20, 1961. Stopping by Woods on a Snowy Evening is perhaps his best known work; and Frost himself admitted that it was “my best bid for remembrance.” Mrs. Kennedy slightly misquotes the three concluding lines, “For I have promises to keep And miles to go before I sleep And miles to go before I sleep.” Jacqueline wrote them on Mary Gallagher’s shorthand notebook in her new home in Georgetown, in 1964, where she moved to after leaving the White House. Gallagher further explains in her affidavit: “This happened to be but one of the many poems that [Mrs. Kennedy] had chosen daily from little stacks of books in which she had placed paper markers to designate the pages that had the various passages for me to type up over the next few weeks. As she explained, they were ‘for the fund-raising dinner in New York on the 16th, to be recited by Frederic March.’ The poem was recited by March at the Kennedy Library dinner and the Democratic Convention that same year. 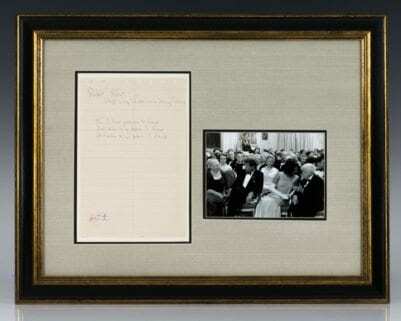 Matted and framed opposite a photograph of President and Mrs. Kennedy and Robert Frost. The entire piece measures 17 inches by 21 inches. "We miss you very much. 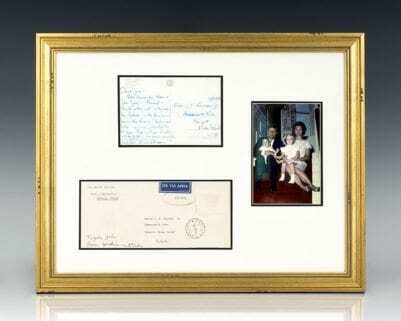 Love from Caroline & Mummy" Postcard from Jacqueline Kennedy to her son John, Jr.
Jacqueline Kennedy Signed Postcard to John Kennedy, Jr.
Postcard from Jacqueline Kennedy to her son John F. Kennedy, Jr. It reads, “Dearest John, Every day we say where is John-John – Away!! – We ride in this cart & the horse has feathers – & we play on a beach like this & I found a sea horse – & we go up this hill to our house. That is a tower to look out for pirates – We miss you very much. Love from Caroline & Mummy.” Written on a postcard from Amalfi which she has addressed to “Master J.F. Kennedy Jr.” The verso shows a colorful illustration of the seashore including a horse-drawn cart, beach, stone tower, and village. 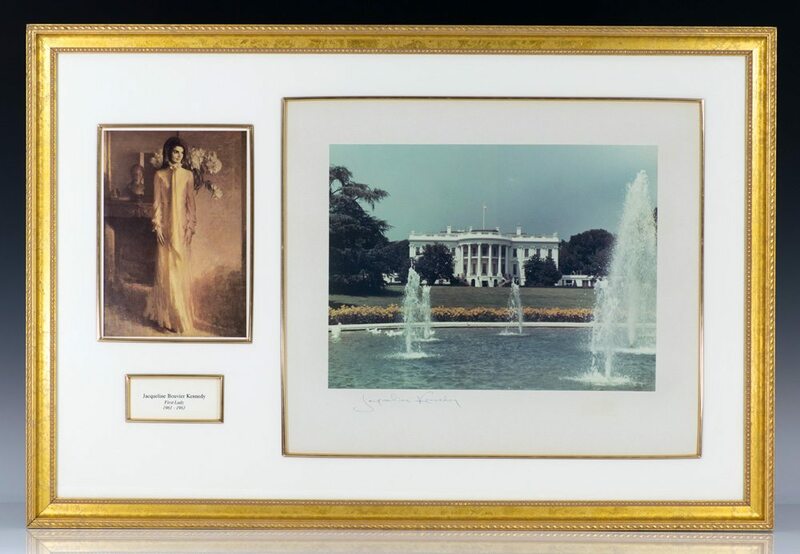 Accompanied by a White House envelope with the typed return address, “Villa l’Episcopio RAVELLO, ITALIA.” Double matted and framed opposite of photograph of the Kennedy family. The entire piece measures 15 inches by 19 inches.